This is the second piece in my Dubai desert inspired series. When I visited the desert, I felt calm and peaceful. Much like visiting the ocean. People can tell you about it, but there's nothing like experiencing it for yourself. The smooth texture of the sand felt like silk. Carry me across the land is about watching what can happen when you allow yourself to dream. Seeing where life will take you & not being afraid to dream big. 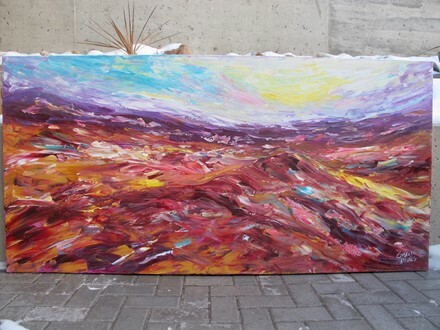 Many people asked me if I was going to paint the desert while being in the middle east. I painted this small series after I returned from my trip there, as I had to work out how I would paint the desert. I painted this, like so many other paintings, in my mind about a thousand times before I actually touched paint to canvas.